I played Destiny for four months straight, logged 380 hours with clanmates on raids, PVP matches and driving in circles collecting materials. I stopped playing one day and haven’t hopped into my dropship since, even with the House of Wolves expansion already paid for. I joined Clash of Clans, went from lowly shack to massive towering castle and would wait for 6 days (literally) for the chance to build my next expansion. I coordinated attacks with allies, and would plan my life around the opportunities to maximize resource collection…but one day I just deleted the app and never thought about it again. These entries and many other highly addictive games (Skyrim, World of Warcraft, Smash Bros.) never managed to become an obsession. Unfortunately, I cannot say that I am immune to the addictive nature of games because there is one entry which has managed to sink it’s claws into me for the past year and doesn’t appear to let go [dramatic pause…..] Hearthstone. 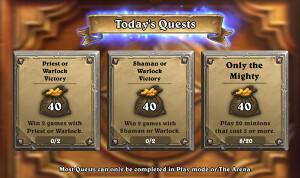 I blame/owe the constant thoughts of Hearthstone to one brilliant gameplay mechanic – the daily quests. Each day, a new quest is generated that will ask players to win 2 matches, destroy 40 enemy minions, reduce the enemy health by 100 or the type of simple task that can be accomplished in a couple matches. There are some which ask the player to win 5 matches or even 7, but these more strenuous tasks provide higher payouts. If you don’t like the quest provided from the RNG gods, you can trade it for another once a day. This means that if you absolutely hate the idea of having to play high cost minions, you can re-roll for something closer to your playstyle. Even the win x amount of matches always provide the option of playing with two different classes. 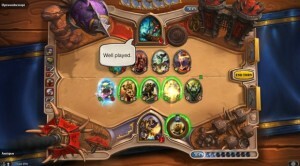 The quests in Hearthstone are constructed to promote players to attempt different options, tactics and techniques into their strategies but will never force them into a grindy situation doing tasks they hate. Quests will sit in the player’s log until completed, but they can only maintain three at a time. This adds a slight sense of urgency to finishing quests and collecting the reward. The gamer doesn’t need to play everyday, but they do need to check in regularly or there is a sense of missed opportunity cost. If the player skips out for five days, they will still only have three quests and a feeling of regret over the gold time stole from them. 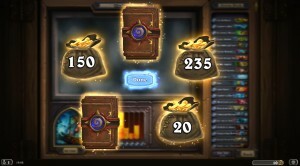 Lastly, and this is the most crucial part of the economy and quest structure in Hearthstone is that playing the game without a trying to complete a quest yields almost no gold. It takes 3 wins to earn 10 pieces of gold. Quests payout 40 to 100 and can be completed in 2 to 5 games. This means if you are playing just to play, you would have to win 12 games as opposed to 2 in order to yield 40 gold. That’s a huge time differential. Obviously games should be fun and the feeling of victory or the opportunity to learn a lesson from defeat be it’s own reward…but no, we are gamers and as such are trained to watch the progress bar fill up and want to maximize our time. That is the design by which Hearthstone succeeds where so many other games fail. It wants you to play everyday for a little bit. Some games try to be the only game you play by constantly offering new doodads to collect and widgets to find to occupy your time. This will burn their playerbase out and leave no room for the casual gamer who just wants to jump in for a little bit. Hearthstone is designed to be played for a few minutes at a time and completed later, the goal is to just become part of your daily routine. And it works. I play a couple matches over breakfast and sometimes before I go to bed if I am falling behind schedule. I don’t want to miss out on earning free gold that others have paid real cash to earn. But on the other hand, when I have completed my quests, I don’t play. This break away from the game is vital at keeping me entertained with its offerings. If quests constantly came in or the gold payout for random wins was higher than the playerbase would power through and lose interest. Instead of being a daily adventure, they would play it for fifteen hours straight one weekend and then realize they spent 15 hours playing a videogame about cards and stop. This decision would seem risky to most developers, but it has worked for Blizzard. Instead of the standard rush of sales and increased cash flow they are building a steady base of players who will trickle in with purchases when a new expansion is released or single player campaign announced. (everything in the game can still be accessed without spending real money). Limiting how much the gamer wants to play by reducing the rewards for winning is brilliant because it makes those opportunities for higher rewards seem that more critical and necessary to jump in. This is the power behind the daily quests and the secret sauce to Blizzard’s success. Hearthstone has turned an entire population of gamers into Pavlov’s dogs eagerly drooling in anticipation of the next quest to load.